Ed Hain thought his corn was a liar in the fall of 1975. Atop a John Deere 7700 rumbling through a Nebraska field 80 miles west of Omaha, Hain watched his combine swallow four acres of 200 bu. corn. When the scale ticket came back, he began walking the freshly cut rows, questioning his own ground. Roughly 150 bu. was a bin-buster, but 200 bu. per acre? Couldn’t be. Hain’s hunt for extra yield paid off in spades. In the spring of 1975, he rolled the dice and planted several six-row strips of corn and soybeans on silt loam soil. One more experiment, one more tweak, and possibly one more dead-end for an insatiably curious Midwest farmer. 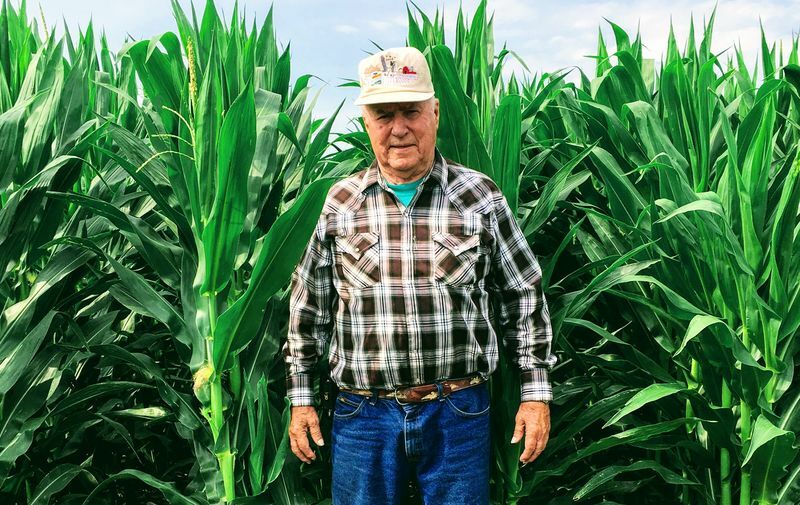 Instead, Hain picked the lock on a corn yield secret that translated to almost 50 extra bushels per acre and catapulted him to an unlikely title: father of six-row corn. Hain, 84, retired in 2008, after a lifetime farming 800 acres in Butler County. His farm brew always contained lashings of mad science flavor, and he incessantly prodded and poked at higher corn yields. In the early 1970s, he went high-low, planting two rows of a tall variety beside two rows of a short variety, essentially using a corrugated effect to grab more sun. Didn’t work. Hain followed corrugation with box blending. “I used a short corn that needed thick planting and a tall corn that puts on a bigger ear, but needs a thinner stand,” he recalls. Hain blended the seed in the planter boxes hoping the tall variety would gobble sunshine and put on big ears, while the tougher-bred short variety competed well below. Didn’t work. Hain planted four strips of six-row corn and four strips of six-row soybeans (both set on 30”). Each row was a half-mile long, roughly one acre per strip. At harvest, Hain cut 200 bu. per acre on the six-row strips, but the adjoining solid corn only pumped out 150 bu. per acre. The market math was a quick tally: Factored on $2.50 corn, a 50-bu. increase meant a $125 increase per acre. In anticipation, Hain built an extension on his combine bin and prepared for a second trial in 1976. “No way. I honestly thought I’d made a mistake. I didn’t want people to think I was crazy, so I planted the exact same test plot the next year and got the same yields. That second year my doubts were gone,” he says. In 1977, Hain spread the innovation to more ground, placing 160 acres in six-row strips of corn and soybeans. He jumped to 320 acres of six-row strips in 1978, with 160 acres in furrow irrigation and 160 in tow line irrigation (essentially a sprinkler system where a 4” water pipe is pulled through a field with a tractor). The same year, brimming with confidence, he placed an ad in the classified section of an agriculture periodical offering to share his yield secrets with anyone for $20 and a self-addressed, stamped envelope. By 1979, Hain had all his corn acres in six-row strips, except for a few check plots as a measuring tape. The agronomics, according to Hain were relatively simple. Using a 12-row planter with the outer three rows tossed off on both sides, Hain planted corn at 34,000 seeds per acre on the outside rows and 26,000 seeds per acre on the inner rows. Roughly a week later, he came back and planted soybeans. Dead-center in the Cornhusker State, and 150 miles west of Hain, Conard Sutton, 67, farmed for 45 years outside the tiny town of Sargent. With steady corn and soybeans on 1,100 acres of sandy soil and clay silt loam, Sutton was highly dependent on irrigation to supplement roughly 18” of annual rainfall. In the mid-1980s, dealing with a dismal agriculture economy, Sutton caught wind of Hain’s yields and decided to shake the tree. “Every farmer’s goal is gaining the highest yields in an economical manner and that’s what I knew was coming out of Ed Hain’s fields,” Sutton adds. He called Hain and received a wealth of advice on six-row, narrow strip farming. In 1986, Sutton started with 100 acres of corn and soybean strips, essentially “ridge tilling” using a six-row Sidewinder with mounted planter units, and a six-row Buffalo planter. All fertilizer was placed immediately prior to planting in a basic formula: 180 lb. of nitrogen, 25 lb. of phosphorus, and 12 lb. of potassium. By the late 1990s, Sutton’s 500 acres of strips produced outstanding yields, but irrigation management became an Achilles’ heel. Strip rows in need of water made for a labor-intensive situation, particularly when trying to get soybeans laid-by despite thirsty corn. In Sutton’s case, irrigation became a restriction. When Sutton’s farming partner and brother, Sterling Sutton, decided to move back to solid fields, the die was cast and six-row strips were out. Picking up the corn baton, Jim Nichols has sprinted down a six-row path in southwest Minnesota. Battered by wind and cold atop the Buffalo Ridge at 2,000’ in elevation, Nichols began farming six-row strips in 2012. In four years he watched corn yields jump by 100 bu. Hain, Sutton and Nichols are of one accord: On the right ground, six-row strips lead to low costs and high yield. “I’d love to see someone on particularly good ground, maybe somebody like David Hula, try out strip production. I’d bet there’d be no limits because nobody has to pay for sunshine,” Sutton says. Thanking about getting into raw crop farming . we got a lot of chicken farms that needs to be feed .I was thinking about buying sum land and start growing corn I would like to get sum help on this . You have to admit that Uncle Ed could plant pretty straight rows with just his eye and a marker on the end of the planter!